So here it is, a creamy Classic Wild Rice Soup in the Instant Pot with Wild Rice, ham (some people use chicken or turkey, so feel free to sub – and this recipe is ideal for any leftover Holiday turkey or ham), mushrooms for deep umami flavor & classic veggies as a supporting cast: onions, carrots & celery. Oh, and a touch of Sherry if you’re so inclined. But we can forget about any “Cream of” Soups. Nope, there’s not a can in sight for this soup – unless it’s canned or boxed broth. 🙂 Instead, a roux (butter & flour cooked together) brings a gorgeous texture and silkiness to the soup. I had a dilemma about that roux in Classic Wild Rice Soup in the Instant Pot: generally, you don’t want to cook roux based items in any pressure cooker; thickening agents go in at the end. So I opted to make the roux in the pan & whisk it into the soup at the end, even if it means dirtying another pan. I like to use my own crazy special blend of Rotisserie Chicken Spice Rub in my soup; I love the flavor in there. Seriously. It’s like an amped up seasoning salt. There’s a version made by McCormick if you don’t want to mix up your own. Or you could riff and add a little seasoning salt or anything else you want. Hey, it’s your soup! There’s only one rule for Classic Wild Rice Soup in the Instant Pot: you gotta use real wild rice, not a blend. While wild rice can be pricey, it’s a healthy grain, and swells to about 3 1/2 times the original volume. I know, right! It’s like me after too many carbs! Take a peek around the bags & boxes at the store. There may be packages of less than perfect rice at a lower price. Like wild rice “seconds.” It won’t matter in a soup. So here it is, the real deal Classic Wild Rice Soup in the Instant Pot, with all the flavor and comfort you can imagine, from up “Nord” to your home, where ever you are. And done in the fraction of the time of a stove-top or slow cooker version. Hope you love it as much as we do! An absolute classic Wild Rice Soup from up “Nord” to your home. 8 ounces mushrooms, large ones dices & kept separate from smaller ones, sliced. Turn on instant pot to Saute, high heat. While it preheats, toss in butter and diced mushrooms & cook until starting to brown. Add the rest of the ingredients, except ham, and stir. Sprinkle ham on top, close and seal instant pot and set to High Pressure for 30 minutes. Use the Quick Release Method. In the meantime, in the last 10 minutes or so of the cooking time, make the roux. In a medium-sized, preferably heavy saucepan, melt the butter over medium heat and whisk in the flour. Cook, whisking often for two to three minutes until the mixture begins to look slightly drier. Turn down the heat slightly and add the milk in several additions, whisking constantly until all is incorporated and smoothed out. Turn up the heat and bring to a simmer, two to three minutes, until thickened. Note: this is a heavy, thick roux, almost the texture of a wallpaper paste. Work carefully in adding the milk so lumps don’t form. When steam has released from the Instant Pot and lid is opened, hit cancel, then Saute, high heat. As soon as the soup begins to boil, whisk the roux in a little at a time. This is best done by picking up a portion of the roux in the whisk and whisking vigorously until the whisk has no more roux on it, then repeating. When finished, turn off Instant Pot and remove the soup in the liner so it doesn’t continue to cook. As the soup cools slightly, it will thicken a bit more. Taste and adjust seasonings. This soup is made in 3 parts; the soup itself in the Instant Pot, the Roux to thicken, in a saucepan. The Roux is then whisked into the soup. Roux based soups like this will thicken significantly if refrigerated and will need to be thinned with broth, milk or water. I’ll be taking this recipe to Fiesta Friday number 204, hosted this week by Sandhya @ Indfused.com. If you’ve never stopped by Sandhya’s blog, full of Indian and Indian American fusion, do so! You’re in for a treat. And be sure to stop by Fiesta Friday and see all the New Year’s posts! Party food galore. Happy New Year’s, ya’all! Over the years, I’ve come up with my favorite ways to flavor this soup, but feel free to alter in any way. If you don’t care for mushrooms, leave them out. If roux isn’t your favorite way to thicken this soup, try peeling two large potatoes, but leaving them whole (use large so they don’t cook so much they disintegrate) on the top. Remove and mash with the 1/2 & 1/2 (you may need less) then return to the soup. If you came to this recipe looking for a way to use leftover ham, be sure to check out the link below for 12 Days of Ham. You might want to see the sister post for 12 Days of Turkey, too. This entry was posted in Click here for Bargain Meals, Click here for Fabulous Food Posts and tagged Alcohol, Bargain Meal of the Week, Carrots, Chicken, Chicken Stock, Frugal Hausfrau, Ham, Instant Pot, leftover ham, leftover turkey, mushrooms, sherry, Soup, Turkey, Wild Rice. Bookmark the permalink. So if a person doesn’t have an instant pot, and not planning to get one, what are the main steps to prepare this soup? My biggest concern is the wild rice, not something I’m used to using. I’m going to assume the soup goes basically like others posted, similar to a bean soup. I would begin preparing the veggies which are sauteed in the beginning and I personally would saute the ham a bit in the beginning, do some of that millard effect for browning before removing it to add to the flavor. I’m not sure how to handle the wild rice. I have as much experience with it as I’m assuming most people in Minnesota do with steamed crabs or oyster stew. (I’m a Marylander). I used to be in Minneapolis every so often for my job and I made the mistake one time of ordering a fish dish in the hotel restaurant. I mistakenly assumed if it were on the menu the chef was familiar with fish and how to properly prepare it. After all, chefs tend to move about quite a bit. Well I’ll never make that mistake again. I think I can truthfully say it was THE worst dish I have ever been served my entire life and ive been given some bad ones, especially in college. Not only was the fish so overcooked and rubbery I could have made bicycle tires from it, it was then served with something called “cranberry salsa”. Revolting doesn’t begin to cover how awful it was. I think it actually traumatized me. Well I’m not going to pretend I know how to cook wild rice properly. Perhaps you can let me know what should be changed in what I’m assuming is the basic prep for this soup and what to do with the rice. Hi & good morning – – stay tuned, I’m typing it out! Hi Pamela! You must have been traumatized if you remember it! Most Chefs here at least deal with fresh fish like Walleye, wow. Ok, here’s what I do, and I always do it this way. It’s weird, I know. I get the wild rice, rinse it and cook it in a big pot according to the directions but with a cup or two more of water (the directions usually cook the rice until dry and it’s easy to have the water boil away. I’d rather add the extra water and be safe.) It’s done when a few of the grains have burst, but it is tender and has just a bit of a bite. I drain it and set it aside. It takes about 45 minutes or so. While that’s cooking, I start with ALL the butter in the pan and saute the mushrooms, set them aside and then toss in the onion, carrot, celery and saute until the onion is transclucent, and vegetables are soft, about 10 – 15 min? Add the garlic, then cook for a minute. Then I add the flour, just a quarter cup, not a third of a cup, stirring it around until the mixture looks a bit dry, then the stock, stirring. You might need a bit more stock. Add the mushrooms back in, the herbs & seasonings, simmer about five minutes, stirring now and then. Add in the ham & the wild rice to heat through and then the milk or half and half. Taste and adjust seasonings. The biggest thing is that the soup, after adding the flour and stock, has to be thin enough to cook the veggies in and it will thicken up a bit as it cooks. I don’t have my actual recipe, I’m in Georgia visiting my daughter and grandkids, but I think this is pretty spot on. Looks scrumptious! Nice recipe for us folks up Nord. Yes! And you’re up there in the bitter cold, huh? I’m still in Georgia, where it IS cold for here, but it looks like I picked a good time to be away from MN. Looks great Mollie– so warming and creamy!! And I have some leftover Christmas ham in the freezer! Your recipes are always so practical and delicious all at once! hugs hugs! Thanks, Rhonda, and hugs right back!! By the way after seeing your outing the other day, we had a brief moment where we thought we might go to the Botanical Gardens in Atlanta. Then we looked at all the crazy and seemed to just collectively blow it off, lol!! Maybe when the twins aren’t four, lol! Your soup looks amazing and so perfect for this brrrr cold! My pleasure, Sandhya! It seems to be cold everywhere! We had little snow flakes here in Georgia. Nothing to worry about, but not what I was expecting! I’m just glad I’m not at home in the Twin Cites where it was -17! Every year it gets harder!! Thank you! It’s always a pleasure to have you stop by. I loved your chicken on the Good Eats Facebook page, btw! Pure comfort food! Happy New Year! So exciting to see a wild rice soup recipe for the IP! 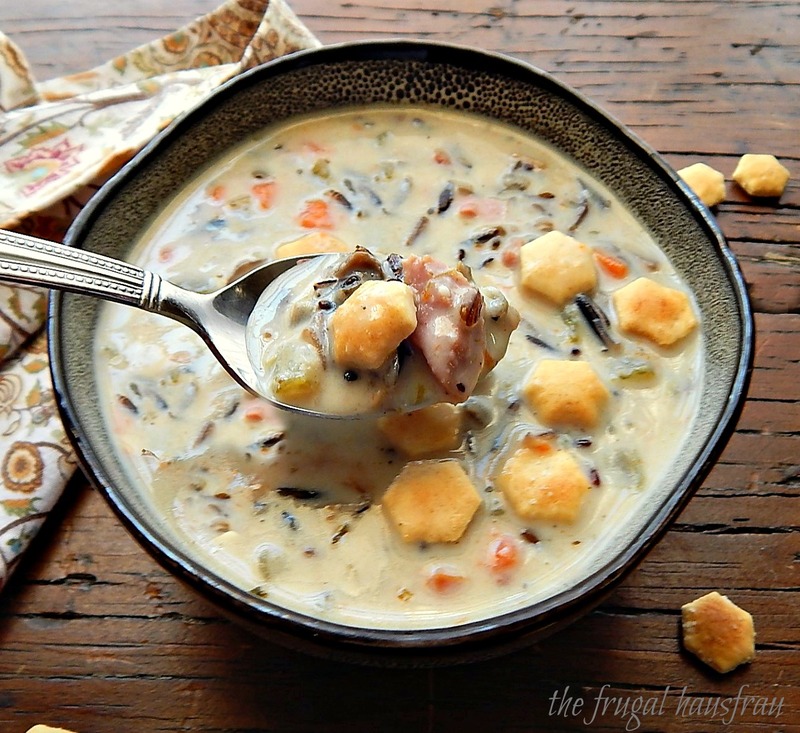 Our family loves turkey wild rice soup best of all the soups I make. (Last week I tried split pea with ham in the IP and it was amazing!) I am looking forward to trying your seasoning suggestions, as I usually only use salt and pepper, as well as combination of butter and olive oil for seasonings. Thanks for all the great recipes! Such a delicious looking soup … pretty picture too. Love the oyster crackers. When I was growing up we never had oyster crackers, and we thought it was a special treat when we went to Grandma’s and she pull out her tin of oyster crackers! So I love them, still, and in my mind I’m being all “fancy” lol!! I love wild rice, but now I realize it’s been a while since I’ve cooked it. This hearty and tasty soup definitely makes me want to rush and buy it soon! Now I don’t have to live in fear of losing my Minnesota citizenship, lol!! I think Wild Rice might be harder to find and more expensive the further south you go? I didn’t test it with a blend but I wonder if the regular rice might get mushy with the longer cook time in the IP. Thanks so much! It’s very traditional in the Minnesota weather. Oh, yum! Perfect on a frigid day like today! Hugs. Hugs to you, Teagan!! Frigid is right – I don’t think I’ve been warm in a week! !